If you follow me on Twitter, you know that I spent the day at the Magic Kingdom since I now have the know how to TWITTER WHILE MOBILE. But not as in driving. Or even walking. In fact, I have to be completely still in order to text and/or Twitter. And if you’re at Disney World and standing in a line or two. YOU’RE GOING TO BE VERY STILL FOR A GOOD WHILE. And that would be my excuse for being so scarce. 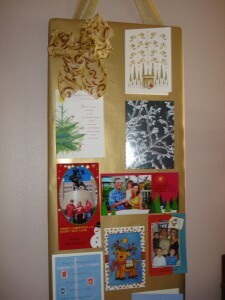 Carrying on with that theme, I wanted to show you how I display our Christmas cards. That is, if we even receive any this year. Since I have not sent out a card and requisite Christmas letter SINCE I BEGAN THIS BLOG. Because I am pitiful. I likely will not get a card and letter out this year either, and will instead say “just go to the blog” with a wave of my pitiful hand. So fortunately I’ve saved Christmas cards from years past and I will simply display the old cards on my walls, and pretend that we still have friends that send Christmas cards. For years I taped cards to the walls. And that just speaks all manner of classy. So I came up with a better way to show of our nonexistent pretend friend’s cards. I talked about this last year at about this time, but I found more photographic evidence to show you. 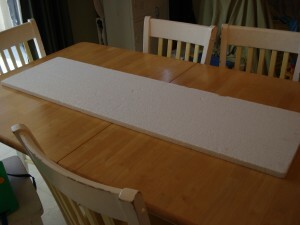 This is the styrofoam board I use. You can find sheets of this stuff at any home improvement store. It’s very thin and light weight. You can also cut it to any size you wish. Mine are long and thin, because they were purchased to use as insulation for the interior of our garage door. 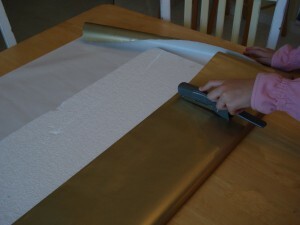 Next, take a roll of wrapping paper, and pretend like you’re wrapping an over-sized piece of gum. 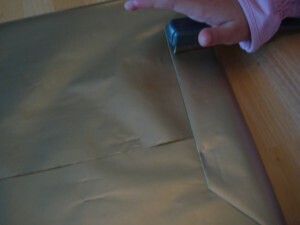 Using a stapler. My trusty assistant, Emme, demonstrates. Behold. 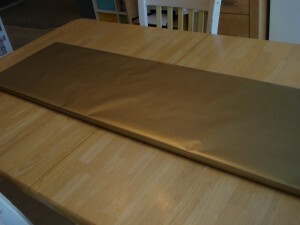 A giant wrapped, stick of gum. You know, it occurred to me that you can also use fabric. Embellish it as you wish. I use a simple fabric bow. (Fashioned courtesy of my Bow Dazzler!) 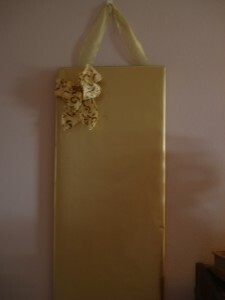 Also, I use a length of fabric stapled to the back to hang it. Since I don’t want to make holes in the wall, I use removable Command Adhesive Mini Hooks. I keep a stash of these for emergency decorating projects. What constitutes an emergency decorating project? For example, hypothetically speaking of course, you’re having company, and you want to disguise an unsightly stain on the wall. Hypothetically. And btw, yogurt is a stain that WILL NOT COME OFF OF A WALL. Or ceiling, for that matter. You can make as few or as many of these as you need. Depending on how many friends you have. Or in my case, how many cards I’ve saved from Christmas Past. That’s pretty! Thanks for the great idea. And here I thought I was the only one who put old cards out to look like I have lot’s of friends, lol! So, the Bow Dazzler? Have you blogged about that before and I missed it? I saw one at a store the other day and seriously considered buying it. Is it worth it? For someone who can barely tie her shoes? Hypothetically. How very creative! I think this Christmas is going to be a very frugal yet decorated Christmas! 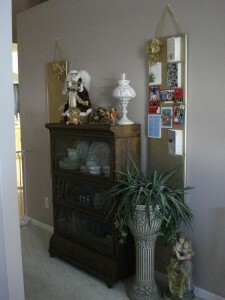 I’m loving all the decorating tips I’ve found on this blog carnival and yours will definately be one I use!! OK, can I do bullet points? -I too know that pain of the yogurt stain. Is it the fat in it or what? And my kids eat yogurt EVERY SINGLE DAY. So we have tons of those. – I think this craft is such a great idea, however, I too say “go to the blog” with a wave of my hand, so I think the total of cards we receive this year will be minimal. Like, 2. – I affix the ones I DO receive in a very organized fashion, to my fridge. With various magnets. Cause I’m classy too. -And finally, I have about 500 of those sticky command thingies. And no earthly idea how to use them. It’s really pathetic. I have attempted more than once. And concluded that I must be an idiot. It’s the peeling of the back. I can’t figure it out. Maybe you could do a post on that? And secondly, I’m totally impressed at your ability to text. I have never sent a text. Because I am uncool and in my late 30s. And it costs 25 cents every time to send / receive. And I am cheap. And did I mention old? Boy, do I feel old. Love it!! It looks really nice. Thanks for passing along a great idea! What an awesome idea! Now I know what do to with all the cards we receive this time of year. I love that idea. But I too am pathetic and probably won’t send out cards! Too much stress! So, if I get any, I’ll be very lucky and if I need to put them somewhere, I’ll post about that. But that’s all hypothetical talk! If I’ve said it once, I’ve said it a hundred times. Y’all are my people. Wonderful idea!!! I love it! I too have been known to tape cards to our door. Love the idea!! !